This bird is a Philippine endemic. It is a type of sunbird. 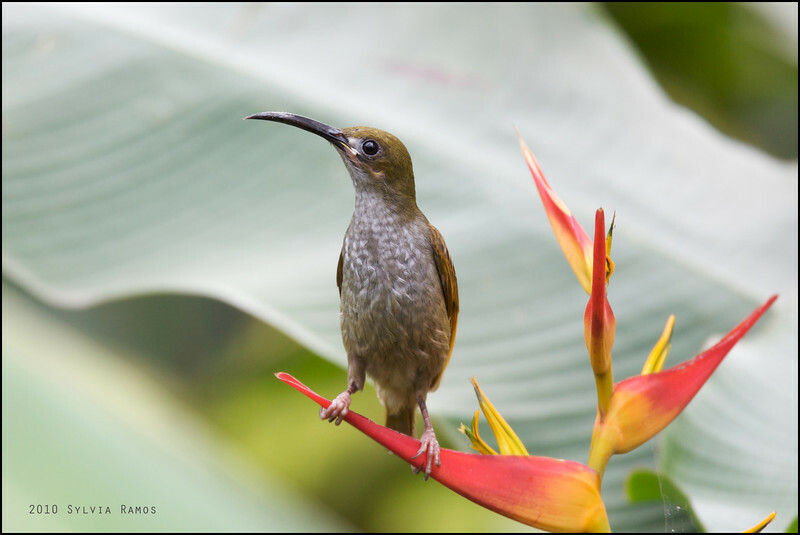 It measures 6 3/4 ", the biggest of all the sunbirds. Its call is described as "loud and raspy". We went to La Mesa Ecopark to "twitch" this bird after seeing a picture of it posted in Facebook by Edu Lorenzo. As with all twitches, there is always the risk that the bird you traveled to see might not show up. Add to that the thought of driving across town through last-weekend-before-Christmas traffic AND birding in an unfamiliar public park. We went there with Paolo D. When we arrived, we saw more birders from PBPF. La Mesa Ecopark turns out to be a popular place for Christmas parties, pre-nuptial photo shoots, family outings, joggers, and all sorts of people who want to spend time in nature. The security guards there reported that there were 600 people there that day! The park opens at 7pm. The guards let all sorts of people enter before this official opening time -- EXCEPT photographers! They made us wait for one hour so we could first get a waiver from the park office. Edu L reported that the bird is most active at 10am, when the sun has warmed up the nectar in the flowers. We were able to see the bird even at 8 am. We were worried when we saw that 10 am, the birds supposed "peak feeding hour" also coincided with the peak noise from the company Christmas party that was going on right next to our birding site. We waited, still hopeful even with all the noise and commotion going around. After waiting for an hour, we decided to pack up and head for home. This proved to be the charm! Two spiderhunters showed up right after we packed up! This trip was also memorable for me because I forgot my camera body at home! I only realized that I didn't have a camera when I opened up my gear bag at the parking lot and saw my body-less lens. Tonji was very nice and let me use my cf card in his rig!